One of the "Carols for the Several Days of Christmas"
And God is now made Man for man’s redemption. By whom this heavenly Babe is in a manger laid. We shall believe and see all that the angel saith. And tongues with joy be silent in this great mystery. How can we but rejoice and all must merry be. What cause of greater joy could ever happen men? The Creator made Creature, who shall these secrets scan? Our God most high and great is a poor Virgin’s son. His pleasures do suffer, His treasures are in want. And for to make us rich, most poor He lives and dies. To thank and praise and glorify their Saviour and their King. Glory unto Them now and evermore. Amen. This stanza, perhaps because its theology is vague, is omitted from the carol as it was traditionally sung in various parts of Co. Wexford. For the traditional music see The Past, no. 5 (1949), p. 88. The reference in the footnote concerning traditional music is to the "Song for New Year's Day," (First Carol for New Year's Day), Number IX of "The Kilmore Carols," from The Past, no. 5 (1949), p. 88. First line: "The first day of the year | Jesus to us doth give". Sheet Music “Neen Major Neal” from Ranson, "The Kilmore Carols", p. 88. This carol is no longer sung. It is not included in Rev. Thomas O’Byine’s composite collection of Kilmore and Tacumshane Carols. I found it in a modern copy made by John Devereux in 1944. Now infinite Highth is Low and Infinite Depth is shallow. The greatest length is short, the greatest largeness narrow. 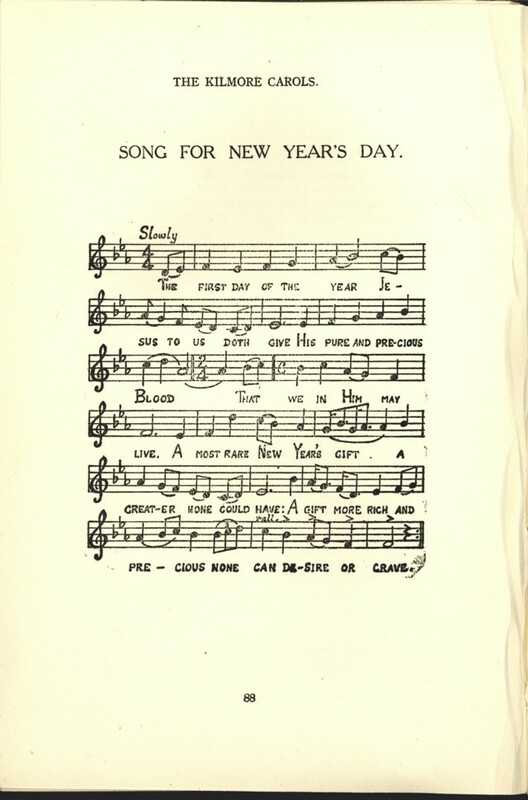 As noted, Dr. Wadding directed that the Carol be sung to the tune of “Need Major Neal.” To the same air he set the words of his Song for New Year's Day – “This First Day of the Year.” Below is given the Kilmore air for Dr. Wadding's New Year's Day Carol which, as Mr. G. M. Palmer points out, “is in the Dorian mode and obviously very old.” I do not know if the Kilmore air and “Need Major Neal” can be equated. There then arises the question who was Need Major Neal – Major Neale's Daughter? It is not unlikely that she was the Wexford maiden. “Onor nyn Neale (Honor O'Neal) of Old Ross who in 1602, July 2nd, was pardoned for having broken the peace (Flants. Eliz. 6660). If our surmise is true, Miss O'Neal was something of a local patriotic heroine who provided matter for a ballad the air of which was popular in Dr. Wadding's time. In "The Kilmore Carols" this is the Fourth Carol for Christ's Nativity.